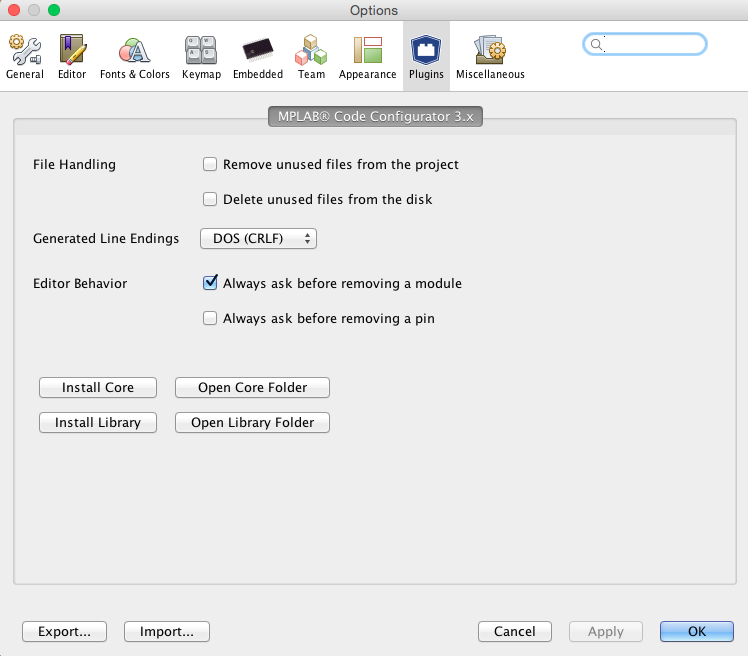 Several aspects of the operation of the MPLAB® Code Configurator (MCC) can be managed by using the Options panel which can be invoked by clicking Tools>Options>Plugins (for Mac it is under MPLAB X IDE>Preferences>Plugins). Remove unused files from the project: Enabling this option tells the MCC to remove .c and .h files for modules which were removed from the MCC configuration between the subsequent generation procedures. This option ensures that the files which are included in the project (and thus in the compilation) are only those which are strictly necessary. However, this will not delete the files from the disk. Delete unused files from the disk: This option gets enabled only when selecting 'Remove unused files from the project'. This performs the additional task of deleting unused files from the disk and therefore, files cannot be recovered anymore. Specify the type of line endings to use in the files generated by MCC. The default is DOS (<CR><LF>). Unix line endings (<LF>) may be specified. There are two options for the IDE operations. sure? dialog box which appears while disabling or removing an enabled module. Libraries can be added through this setup. This has essentially been upgraded through the Versions Tab. 1. Use the Install Library/Core button to add an MCC modular Library or Core to the MCC plugin. 2. Use the Open Library Core Folder button to view the MCC modular Libraries/Core folder.